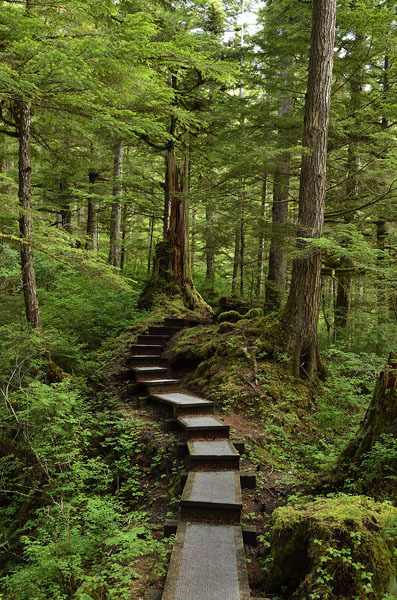 The Anan Creek Bear Observatory has been on our wish list for a while, and it’s not far from Wrangell. We arranged for permits several months ago, since the area is restricted to a maximum of 60 visitors per day to prevent humans from putting too much pressure on the bears. Most people get there on a tour by jet boat from Wrangell or by float plane from Ketchikan, but we had the luxury of being able to stay for (almost) as long as we liked. The weather was calm enough that we could anchor ADVENTURES just off the creek mouth, though we could only stay there from 10am until 4pm while the tide was high enough. We took the dinghy and landed among the boulders on shore, and were greeted by a Ranger who made sure we didn’t have ANY food or drinks (aside from plain water). We received a safety briefing before setting off on the mile-long trail up to the observation platform perched over a salmon stream. We arrived near the platform and were waved on by a Ranger there, entering through a small gate that we were careful to close behind us. The stream rapids were roaring and we could see salmon leaping, but no bears at first. Then, quite quickly, a black bear came out of the woods and walked right past the platform, and that’s when we learned about the duct tape line on the platform deck that everyone has to stay behind when a bear is close. Close! The photo above was shot with a normal lens, not the big telephoto. It’s normal for the bears to walk right next to the wooden railings of the platform, and occasionally they would squeeze through an opening between the ground and the platform and climb down the rocks underneath it. (They could easily hop over the fence and enjoy a Tourist Buffet, but they don’t.) All this happens fairly quickly, and you just need to pay attention. If you need to use the bathroom there’s an outhouse about 25′ from the platform, but now we realize that the path to the outhouse crosses a path that’s often used by the bears. 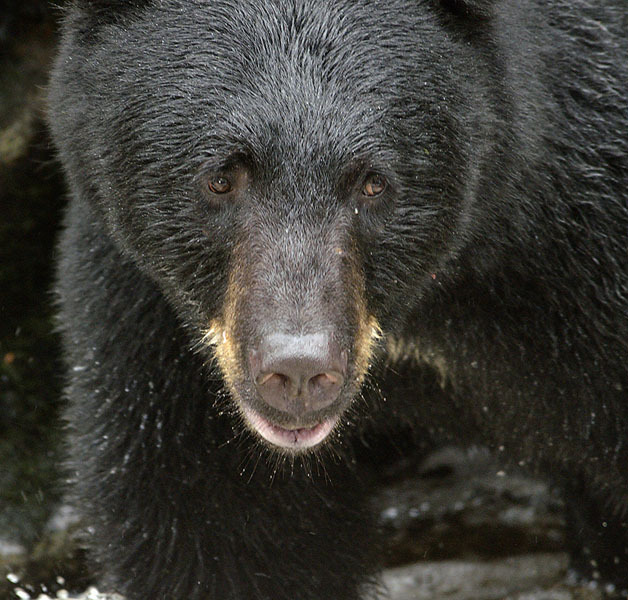 There’s a system in place to accomplish the task safely: you alert the Ranger that you want to “go”, and they will make sure no bears are approaching. When you get the OK signal, you scamper over to the outhouse and LATCH THE DOOR. The edge of the outhouse had quite a few deep scratches in it, nicely painted over by some work crew, but still obvious as to what made them. Once you have accomplished what you went there to do, you stick your fingers through some holes in the door and wiggle them – that’s the signal to the Ranger that you’re ready to emerge. They will hold up a hand while they scan the woods for activity, and when it’s safe for you to cross back to the platform they will wave you on. A boating friend told us that he once spent 20 minutes in that outhouse waiting for the all-clear signal. You can’t make this stuff up. After about 30 minutes a few bears started to appear. Some came from the woods and some from behind big boulders right next to the stream where they like to hide and nap. 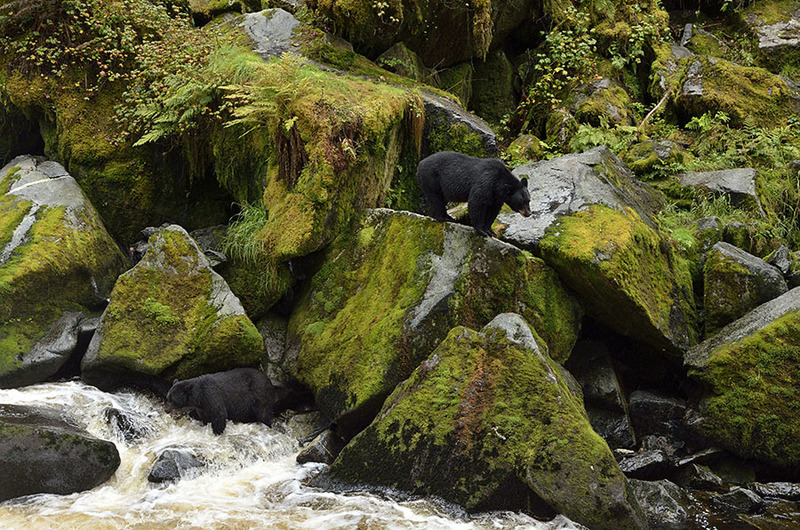 It was fun to watch various bears – some were expert fishermen and didn’t take long to catch a fish, and some must have been younger and still learning. This fellow FINALLY caught a fish after about 45 minutes of half-hearted attempts, and then he proceeded to gum the poor fish to death. 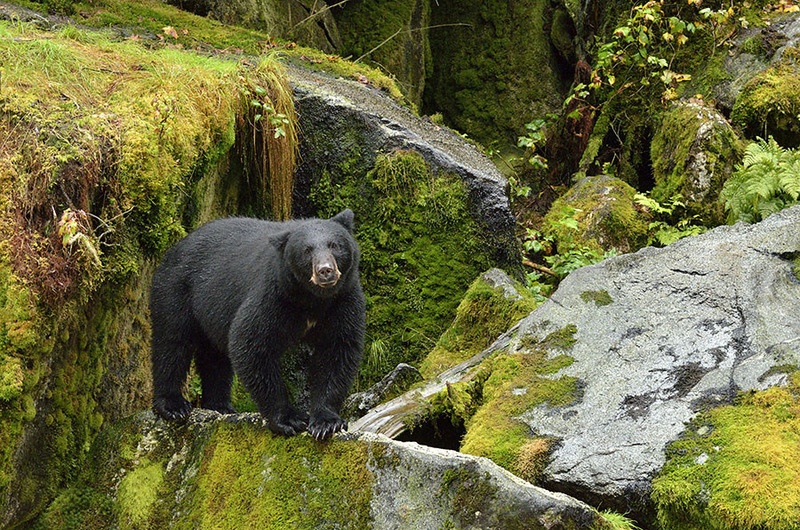 There was a definite pecking order among the bears because when certain bears came out of the woods or from behind the boulders others would move aside and wait, impatiently. 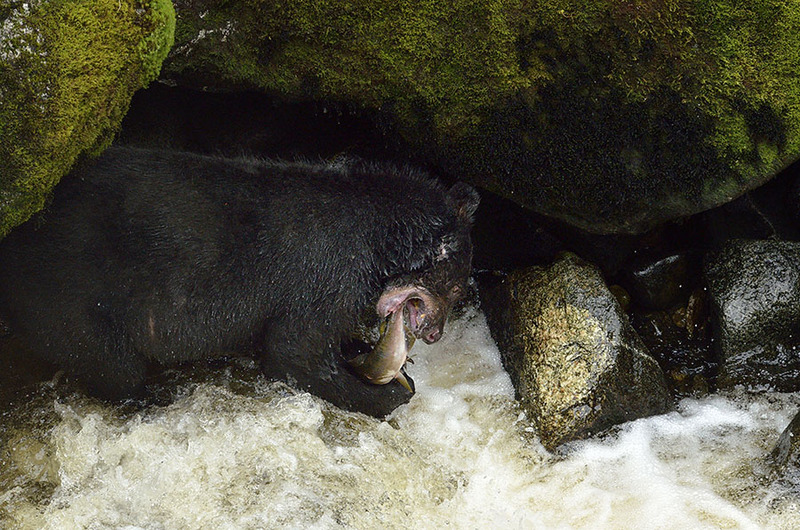 Do we ever tire of watching bears fishing and doing other bear-ish things? No way. Eventually we had to leave since the tide waits for no one. We thoroughly enjoyed our day on the platform and down in the photo blind, and it was a nice hike back through the woods to our dinghy. At one point on the trail we were approaching a little foot bridge, and a black bear appeared on the bridge coming towards us. Jim was in the lead and he firmly told the bear that we wanted to go that way. 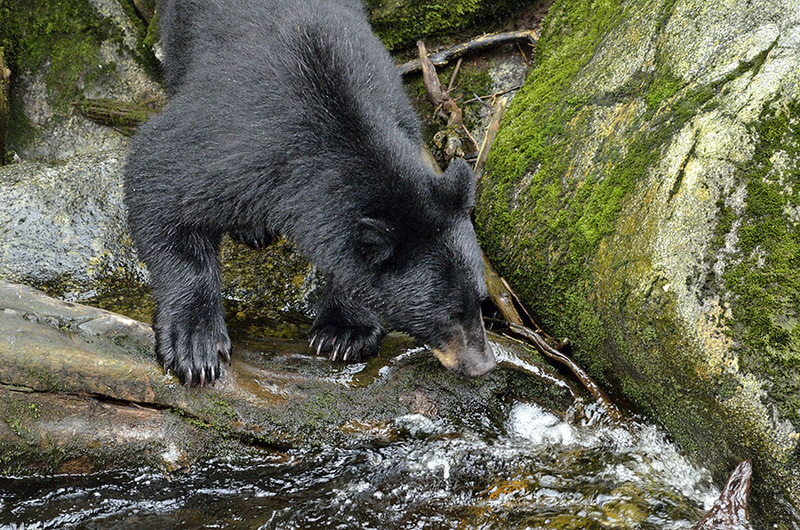 The bear stopped to look at us, then took a few more steps in our direction – HE wanted to go where we were. 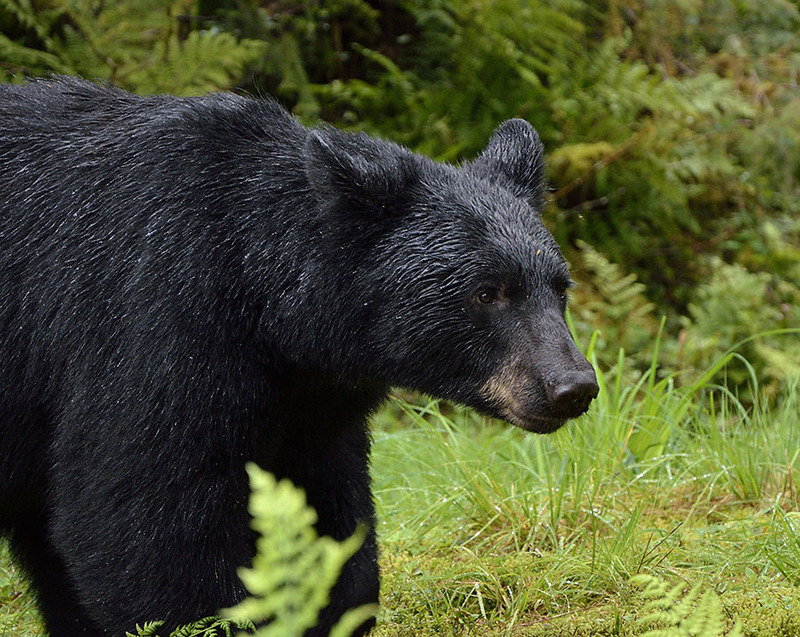 Jim told him again that we weren’t moving, and the bear reconsidered and left the trail. 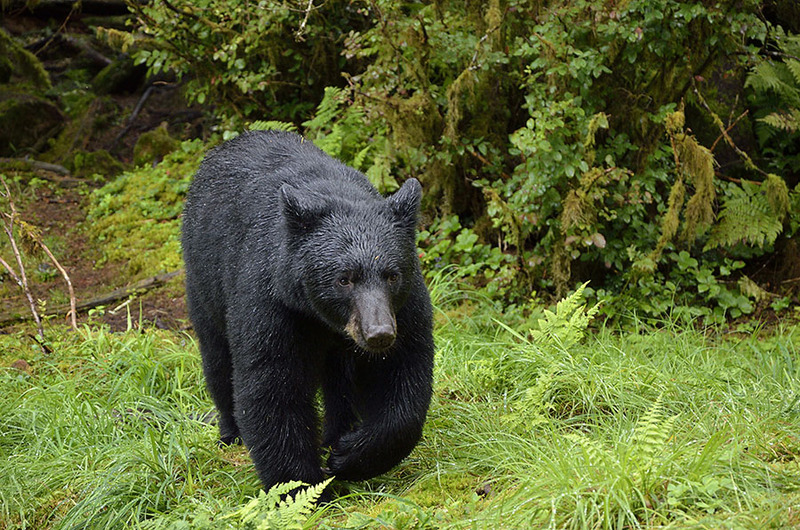 That’s our second encounter with a black bear on a trail this season, and both went just as the guide books say (though we had our bear spray at the ready, just in case). We anchored in a place called Fool’s Inlet for the night, and had a blast watching all the seals hauled out nearby, and over 30 bald eagles on the shoreline at low tide… the cherry on top of a most excellent day. We heard about a couple who are kayaking from Vancouver Island in British Columbia all the way to Skagway, Alaska – what an ambitious adventure! – and they were reported to be near Petersburg. There was a bit of a scare since a two-person kayak was found washed up on a nearby beach, so the State Trooper headed out in his boat to try and find them. Fortunately the kayaking couple was discovered safe and sound, though the Trooper advised them to get some brightly colored gear to help with visibility. The beached boat found its proper owner, so it was a happy ending all around. One member of the kayaking couple is a professional violinist, and she’s giving impromptu concerts in some of the small communities she encounters along the way. The word went out on the radio station and on bulletin boards, and we thought we’d see what a paddling violinist sounds like. Well, we were absolutely BLOWN AWAY by the talent and passion of this lovely German gal. 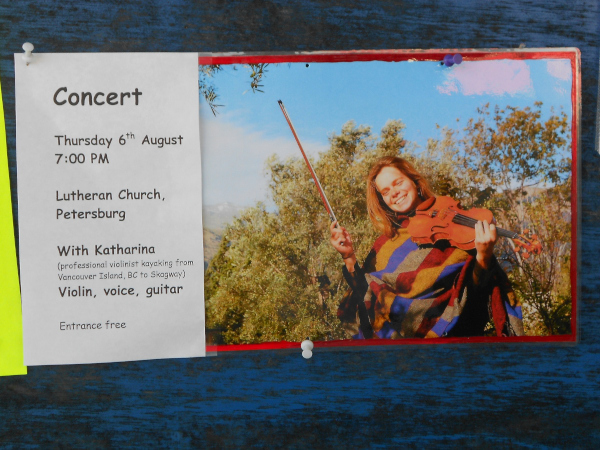 She left us breathless with her performance of classical pieces as well as with some contemporary improvisations, then a few tunes on a borrowed guitar. What an unexpected, fabulous performance. 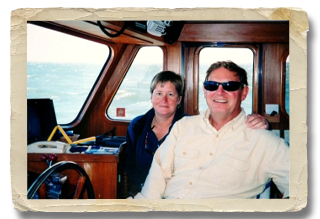 We finally cast off the lines with friends Mary and Bill aboard, heading south down Wrangell Narrows. Keeping with the theme of “you never know what to expect”, we left under glorious sunshine and blue skies, but as we turned the corner we were socked in by fog. It never really burned off – it just came and went, thick and thin, as we cruised. The fog finally lifted and we arrived in Wrangell to check out their excellent museum and to explore the petroglyph beach. One of the gals in the museum suggested a nice hike to Rainbow Falls, so we spent some time enjoying the forest and all the little details that make a walk in the woods so enjoyable. The trail led to view of Rainbow Falls at one spot, and a viewing platform overlooking the top of the falls farther along. This late in the season after a mild winter meant that the falls weren’t roaring as much as they could be, but it was a great hike regardless. 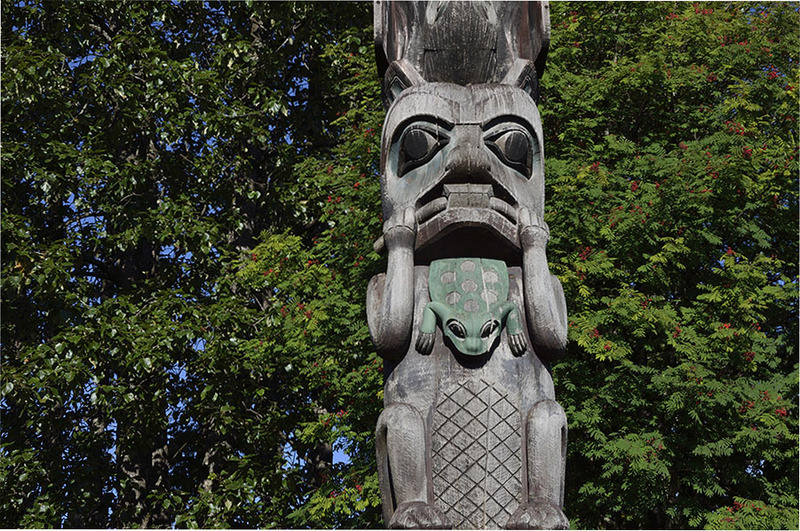 Back in town we checked out the small Totem Park, noticing frogs and beavers among the totemic symbols which we don’t usually see in totems farther north. 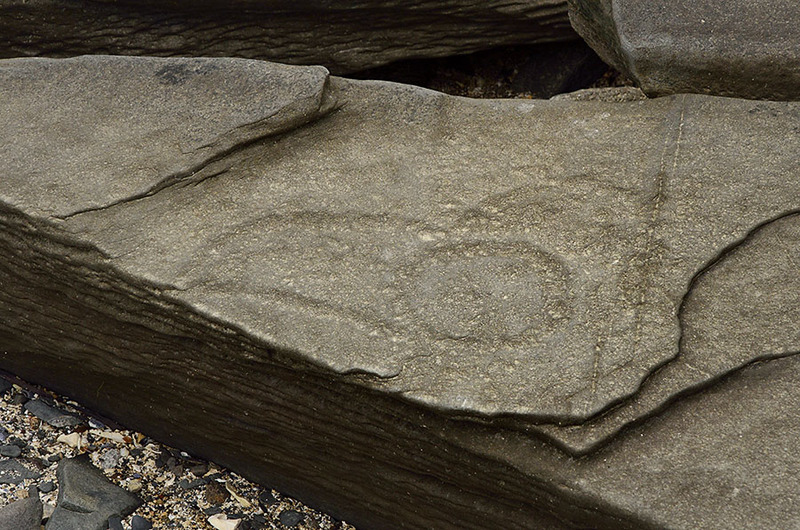 After enjoying excellent burgers at the Stikine Inn, we took our tired feet to the Petroglyph Beach to see how many we could find. Once we spotted the first one it was easier to recognize others, many of which have been faded considerably by time and tide. 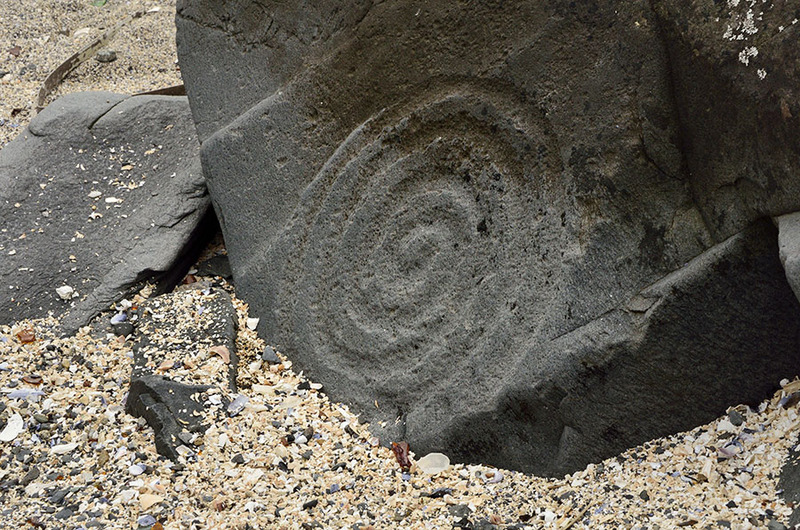 It looks like the petroglyphs were made at different times, and it’s fun to imagine the people who carved them and to guess at the messages they represent. 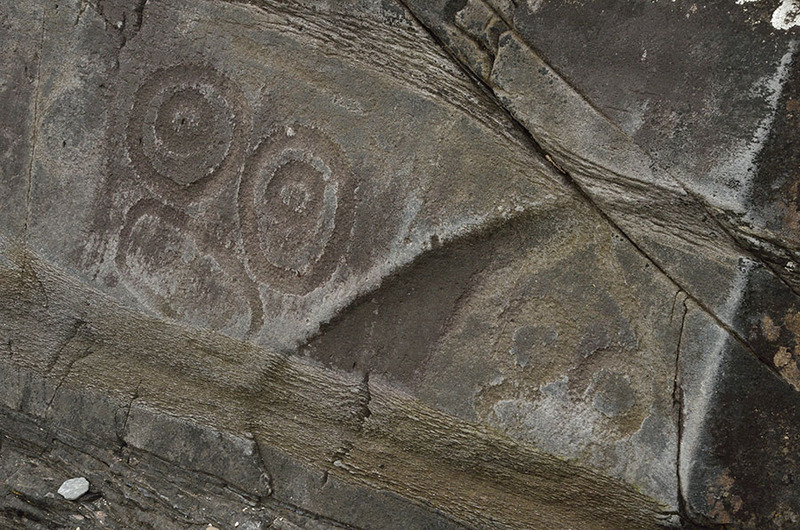 We didn’t find all 40 petroglyphs, but we did find quite a few. Some were so faint it was hard to tell what they were anymore, but it was a neat place to explore and hopefully we can find more in other places around Southeast. As we walked the beach we saw the Alaska State Ferry departing. 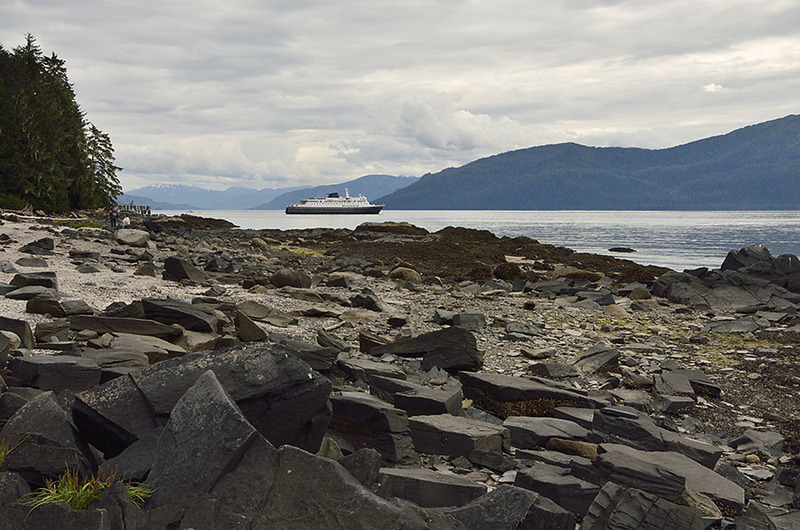 The ferry is also known as the Alaska Marine Highway since it connects the many isolated and island-based communities together. Remember, every car that exists on these island communities got here either on the ferry or the barge. We spent a week back in Petersburg to do a little maintenance and pick up our last set of guests for the summer. 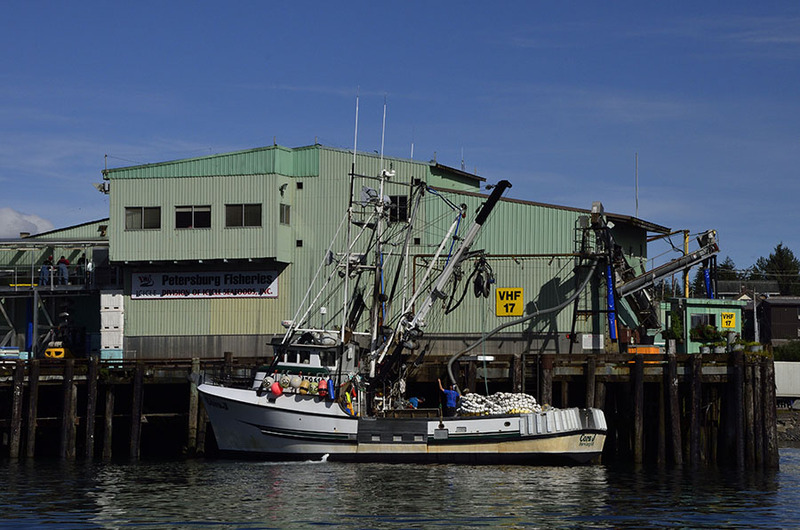 The harbor was abuzz with fishing boats since the salmon season is now in full swing. 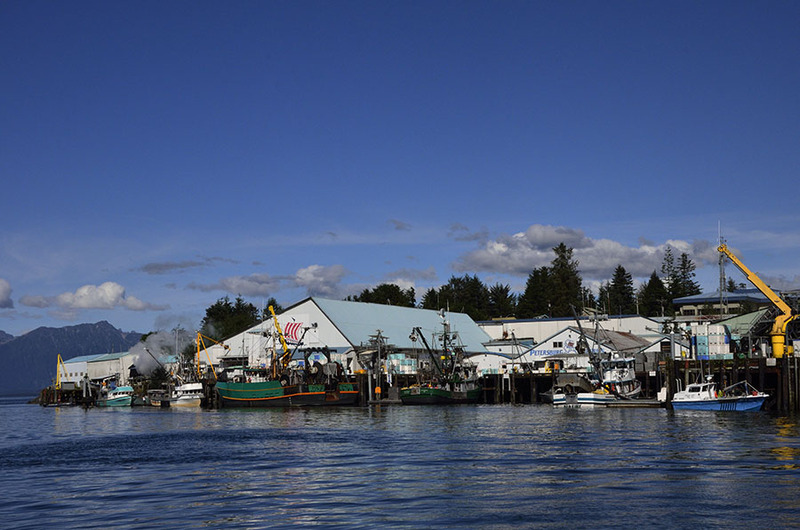 Petersburg Fisheries, pictured above, is one of three fish processing plants in town and is the oldest continuously operating seafood plant in Alaska, started in 1899. During the season the salmon fishery goes through a cycle where it opens for a number of days and then closes for a couple of days, giving the fishing boats a chance to rest, restock supplies, make repairs, and sometimes change their gear to target a different species of salmon. One minute the harbor can be a ghost town with only a handful of boats on the docks, and then overnight the docks are jammed full and boats are moving around night and day as they land at the cannery dock to offload their catch at the appointed time. Sometimes the fishing boat delivers to the cannery directly, and sometimes they deliver their catch to a “tender”, a larger boat known in other places as a “buy boat”, that can hold a great deal of iced fish and can provide some supplies to the fishing boats. The tenders position themselves near the fishing boats so it’s a short trip for the fishermen to offload their catch and resume fishing. Once the tenders are full they make the longer trip back to the fish processing plants while another tender steps in to take its place out on the fishing grounds. 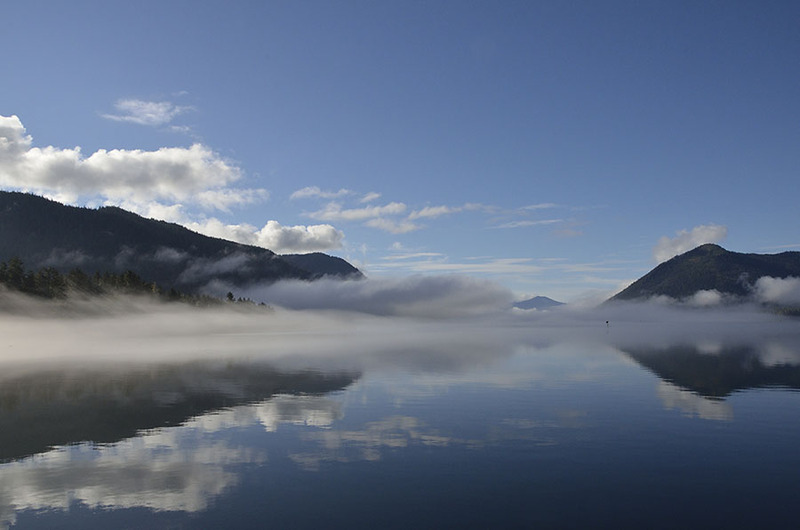 This past winter was very mild in Southeast Alaska and our spring was unusually warm and dry, so now we’re seeing how those things have impacted nature this summer. 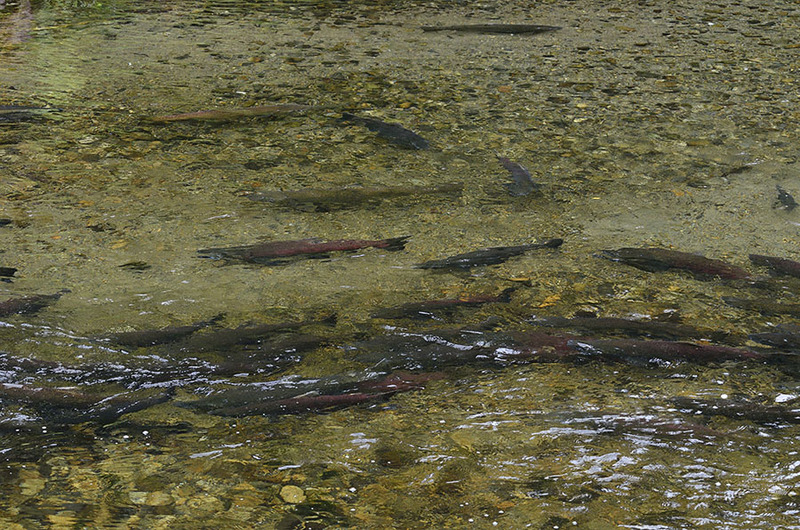 The warm spring was too warm for the salmon so they stayed in deep cold water longer, making their arrival back to their spawning streams a few weeks late. Fishermen saw poor results for the fuel and their hard work early in the season, though things have finally picked up now. The warm spring convinced a lot of plants that summer was beginning (too soon! ), and this year’s berry crop is early and particularly plentiful. 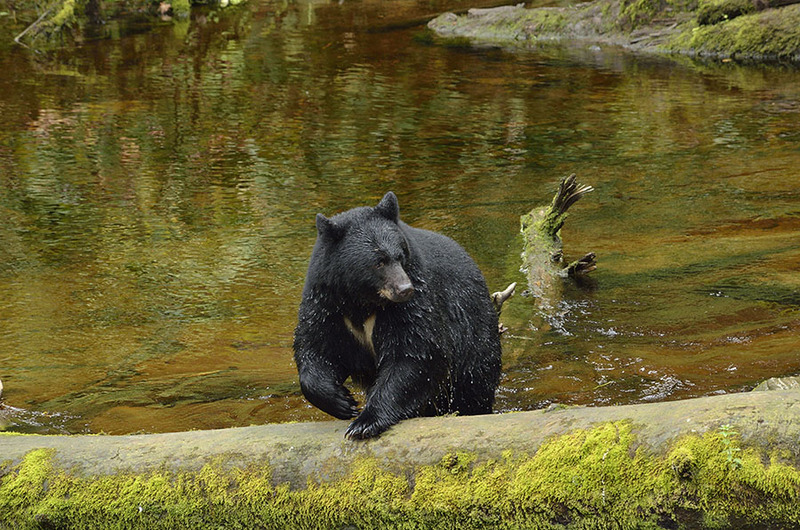 The bears are happy to have so much food available so they’ve been staying in the forest eating berries while they wait for the late salmon that are now just filling the streams to spawn. 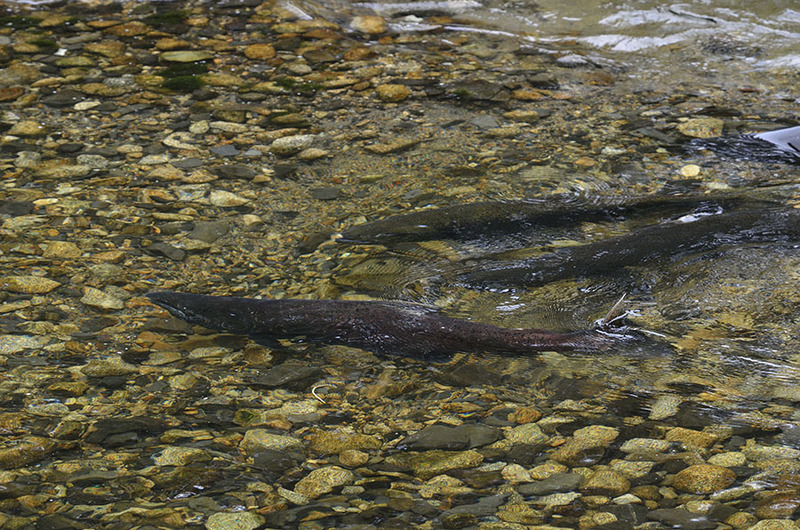 These are king salmon (also call “chinook”), and they spawn at the end of their life cycle, in the same stream where they were born. Salmon start out as a fresh water fish, spending a year or two in their home stream before they morph into a salt water fish and move to the ocean where they live for a few years – a different number of years depending on the species. The last act in their lives is to return to the fresh water where they started life, fighting against the current and leaping up waterfalls to reach the gravelly shallows where it’s best for eggs to incubate. 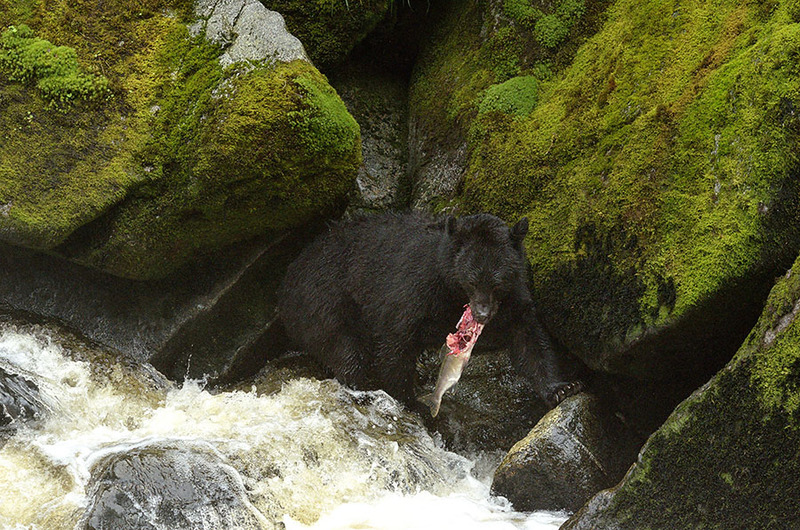 After they spawn, they die, but their impact continues as bears, eagles, ravens, and scavengers eat the dying salmon, carrying pieces of fish well into the forest where the nitrogen-rich fish enrich the soil and keep the forest healthy. The last effect of our mild winter and very warm spring is that plants got an early start on summer and now in early August they think autumn is nearing. 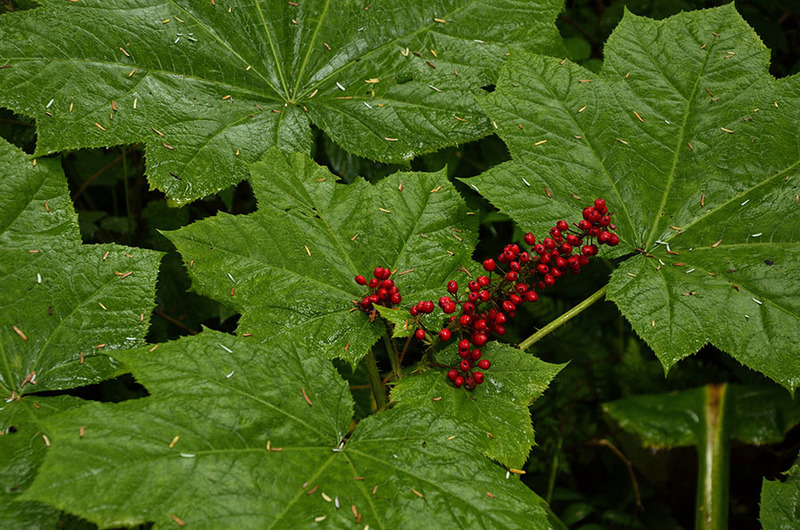 The Devil’s Club has its bright red berries, and many other plants are changing, preparing for winter. 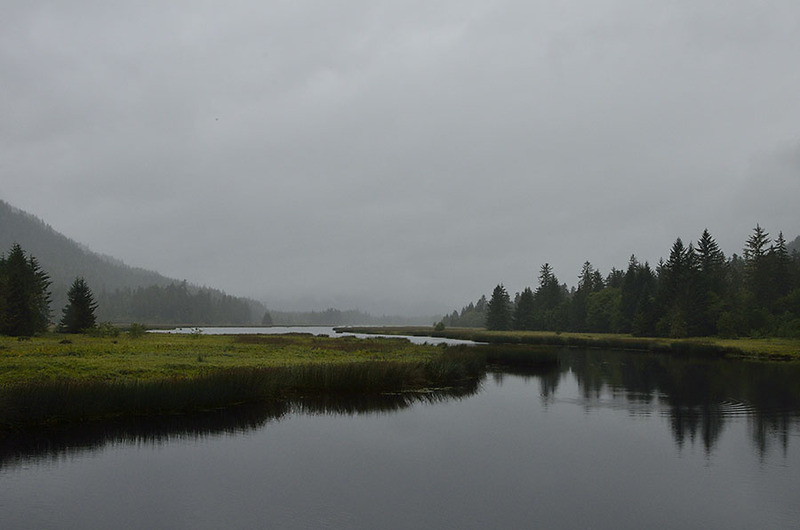 The rainy pattern is starting up again, but even on a misty day the scenery is beautiful. 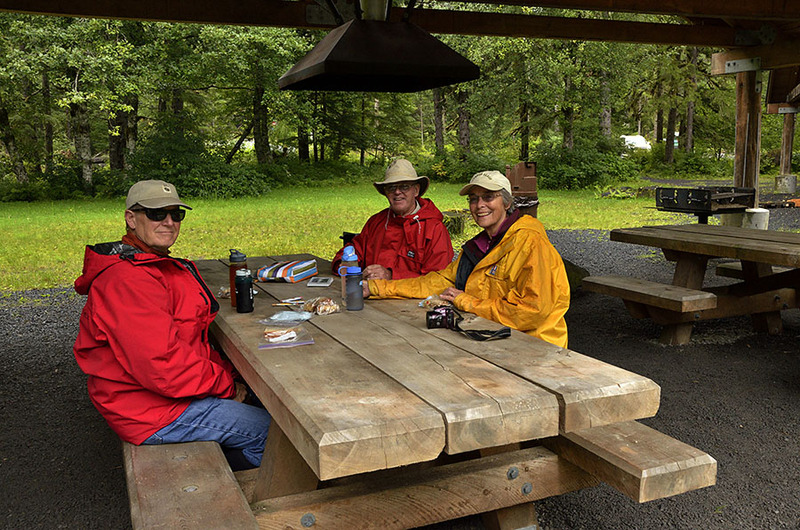 Our friends Bill and Mary are cruisers so they’re not daunted by a little rain, and we enjoyed a picnic and some hiking on Mitkof Island. 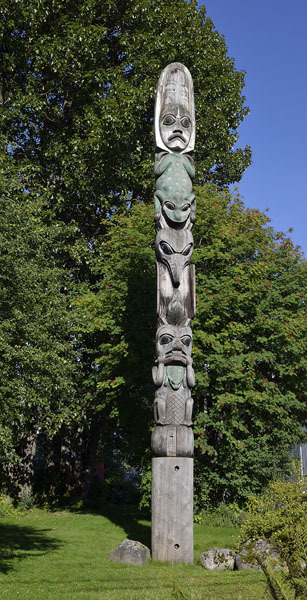 We’ll be heading south with them, heading towards Ketchikan with some adventures in Wrangell, Anan Creek Bear Observatory, and a few other interesting spots along the way. ADVENTURES headed south towards Cape Fanshaw to anchor for the night, running later into the evening to stay ahead of a big weather front that was approaching. 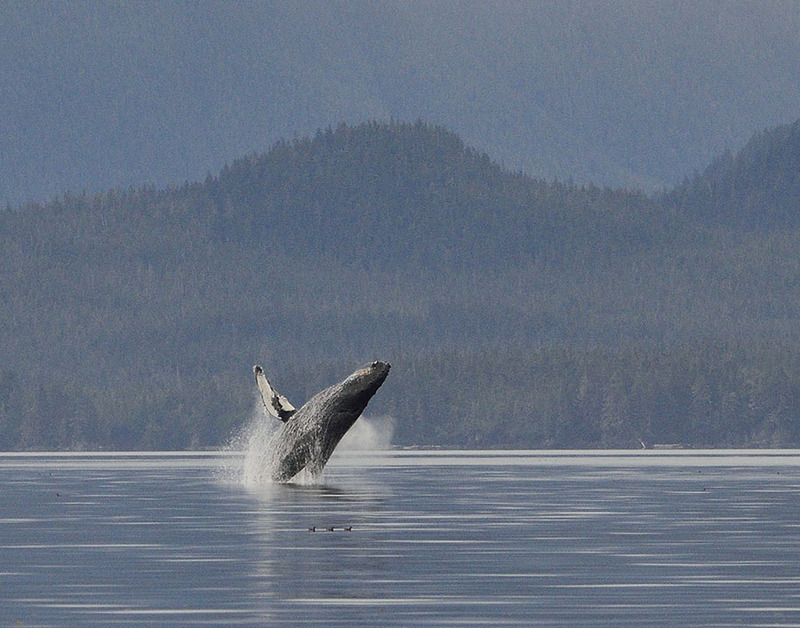 Once again we saw at least 40-50 humpback whales, blowing and diving in every direction. Some popped up quite close to us… …which can be rather alarming since a humpback is about 45′ long and weighs almost as much as ADVENTURES does! Whales were slapping their long pectoral fins on the water, making great splashes… …and we saw some whales tail-slapping as well. In one case, we noticed tail-slapping that was different – urgent and insistent. 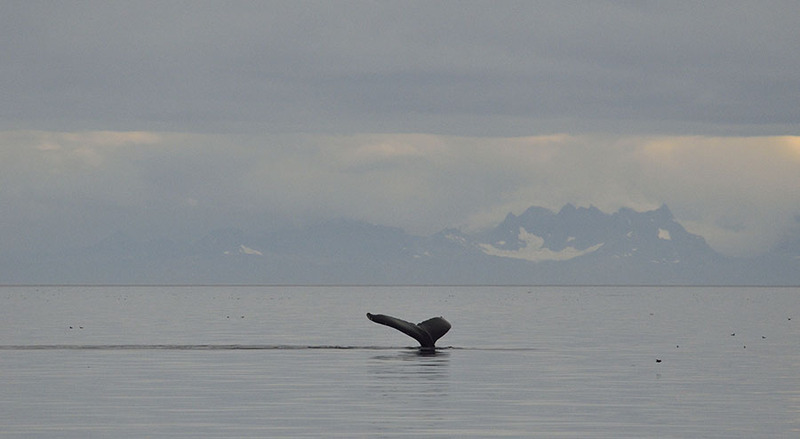 The whale was a good distance from us, but we slowed the boat to watch. 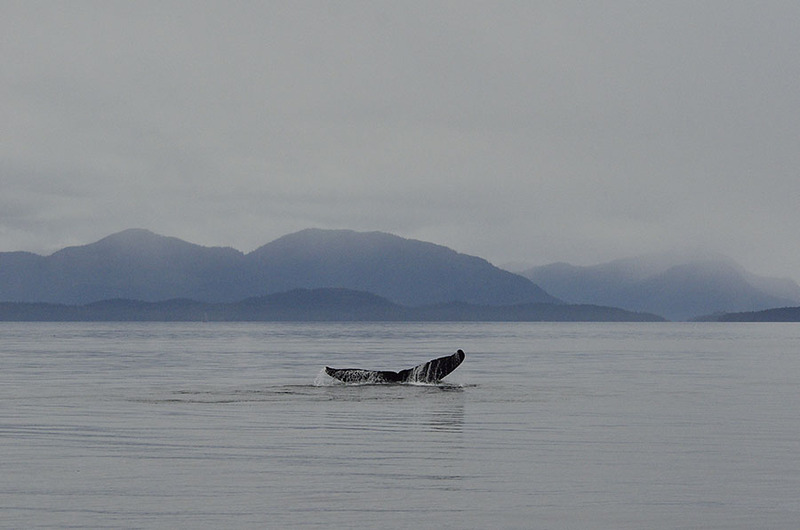 Other whales began to converge on the tail-slapping whale, and we spotted a few orcas near them. 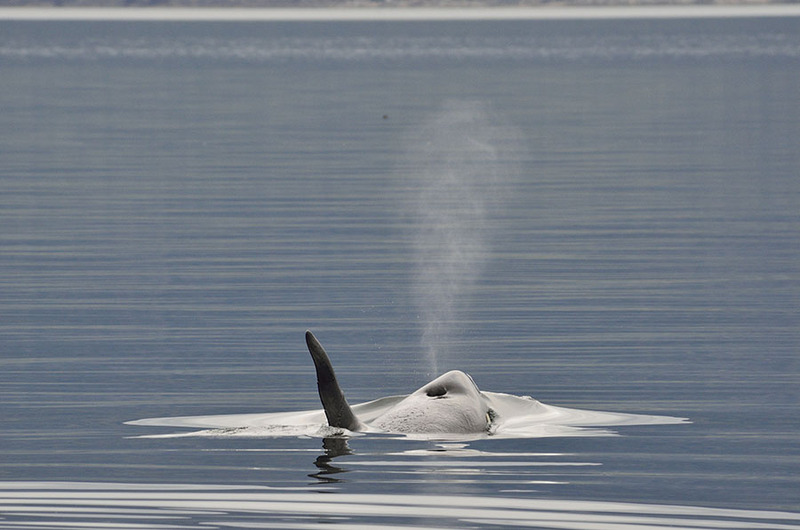 As we watched through binoculars, we saw the water splashing turn from frothy white to red, so we assume the orcas were hunting a young or sick whale. It’s sobering, but it’s nature, and every creature has to eat. 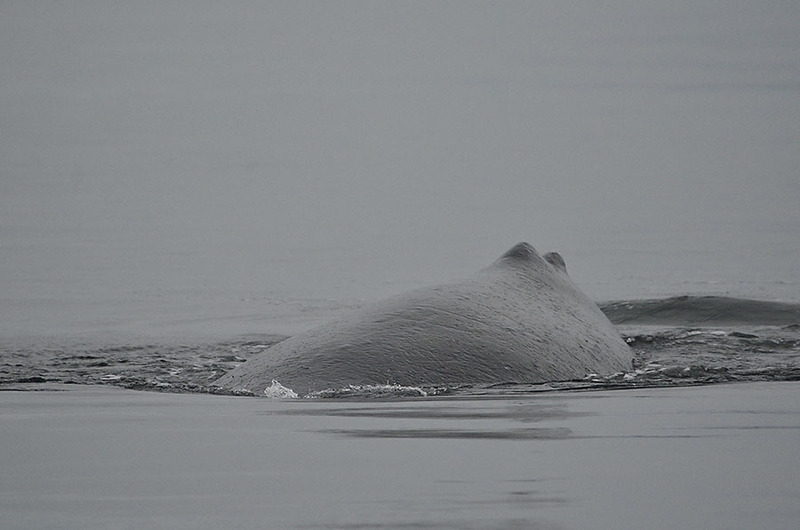 As we continued to cruise along we spotted some humpbacks closer to us, breaching. It’s a tremendous thrill to see 30 tons of whale come leaping completely out of the water, though that first breach is such a surprise that it’s nearly impossible to get a photo of it. Fortunately one breach is often followed by a few more, though each successive one is usually less dramatic than the one before. It takes a few moments to gather enough composure to grab a camera and run outside. 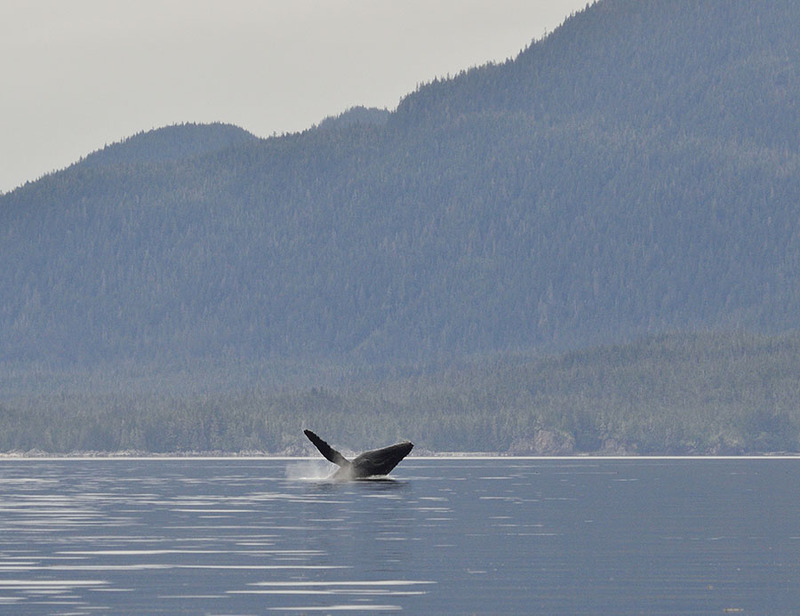 Another whale was diving and blowing as we cruised into our anchorage in Cleveland Passage, putting a nice finish on a great day. The next morning we cruised a few hours to Petersburg, staying just ahead of the weather and enjoying flat calm seas. Once we arrived and settled in, the rain started. Petersburg set a record for a lack of rain in the month of May and now Mother Nature is making up for it with heavier-than-normal rain. 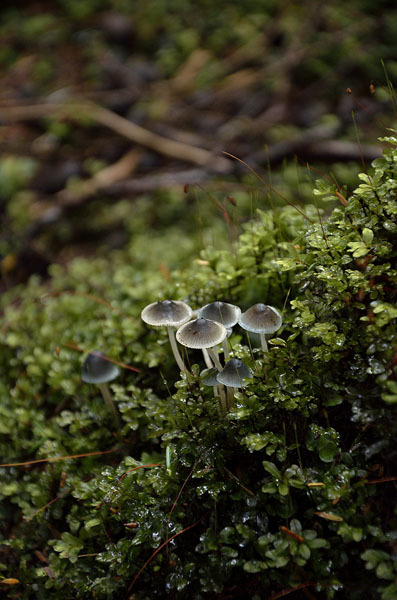 It’s a rainforest – we shouldn’t be too surprised. Despite the weather we headed out to explore Mitkof Island and do a little hiking, to stretch our legs after so many days on the boat. 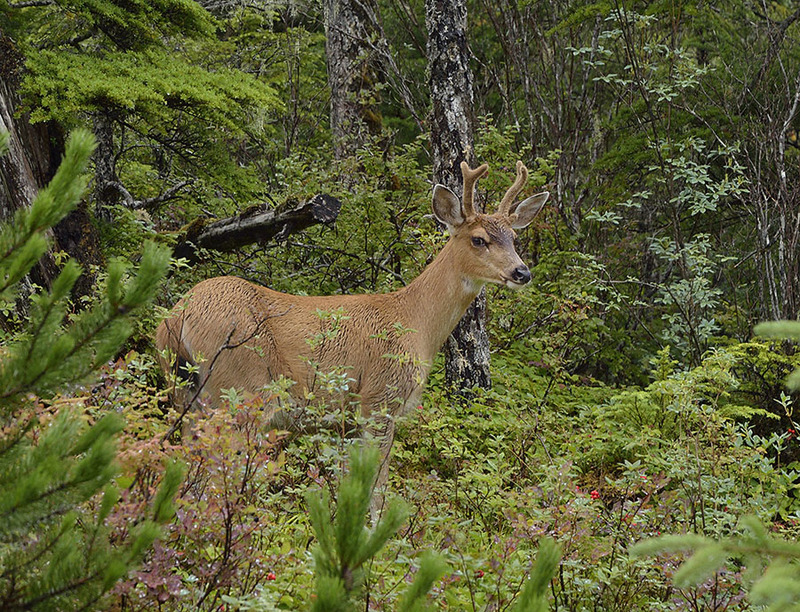 We spotted some grouse and a number of deer with their new velvety antlers. 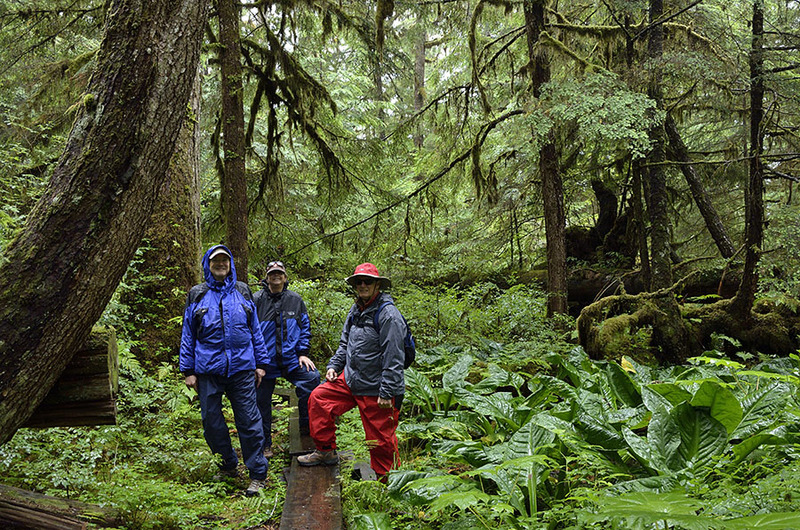 We tried to hike on trails in the woods rather than the more open muskeg in the hopes that the canopy would help keep us a little more dry, but the rain managed to penetrate quite well. Our friends are used to camping and hiking in the rain (it’s a family curse kind of thing), but the deluge eventually dampened spirits enough that we gave up plans for a longer hike. I love the look of the woods in the rain – this far into the summer the skunk cabbage is huge and everything is green and lush. The thick forest looks almost prehistoric, and you can imagine that a giant dinosaur might be around the next corner. 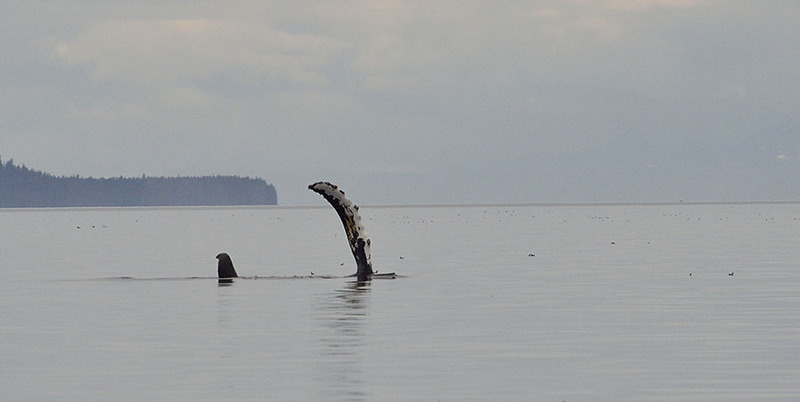 Instead we know that the giants are out there in the Inside Passage – leaping and splashing.